In relation to Henry it's an easy comment to make, he is often engrossed with his train set or shouting at the top of his lungs for no reason or being 'physical'. 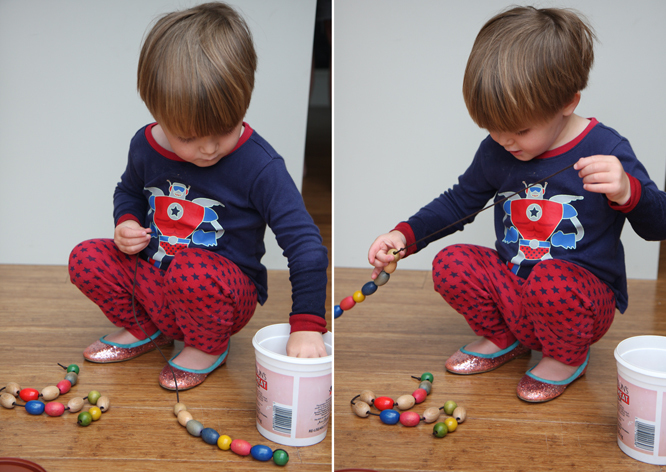 But then he also loved wearing his sisters sparkly shoes and making necklaces on Saturday, so you see, it cuts both ways. Yes he can be 'such a boy' (but don't say so in front of Hugh unless you are interested in getting a lecture) but he can also be 'such a girl' too, so please, don't label him. *I could go on and on about the boring genderisation of toys & clothes, the lack of choice for parents who don't want to force pink on their daughters or superheros and football on their sons - but really, you know the gist and many other people have written about it much better English and with way less typos than me. I have to stop myself saying things like "you are screaming like a girl"
Thanks Hugh - maybe you could sub-edit before I publish!? love his sparkly shoes! precious boy!